The case interview is primarily used in fields and professions where being highly logical is prized. While not suitable for necessarily every industry this type of interview proves very useful in fields such as engineer, consultant, and business management. The goal of the case interview is to determine how the candidate handles problems and how he or she goes about solving those problems. If you are seeking employment at a company that specializes in a logical and orderly field be prepared for this type of interview. Unlike other types of interviews you will be asked to solve an actual problem and not just provide an answer to a hypothetical situation. By putting candidates on the spot the interviewer is able to examine how the potential employee deals with problems and the method they use to solve it. This information is invaluable to the employer to determine whether or not they would like to hire that candidate. 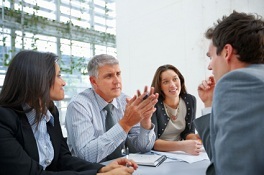 During the case interview you will be asked to work in a group to solve a problem. This group will either be made up of current employees, other job candidates, or a mixture of the two. By placing you in a group the interviewer will be able to examine how you work with others and if you are able to consider different points of views to reach a conclusion. Developing a solution to the problem is just as important as the steps it too to come to a solution. Of course you should be prepared for the eventuality of employers presenting problems that simply have no solution just to see how you handle failure and frustration. In a case such as this the interviewer is more interested in your critical thinking skills and the procedure you use to solve a problem than anything else. Preparing for the case interview is not as simple as preparing for other more traditional types of interviews. While you should be prepared with answers to the most basic of interview questions you will encounter unique questions that center around your ability to analyze different situations and how best to approach those situations. It is important to polish your critical thinking skills as well as your ability to approach problems in a logical manner. Brain teasers, puzzles, and even helping a family member decide on an insurance provider are all great ways to prepare for the interview. There are several resources online that provide perfect examples to situations and problems you may encounter during this type of interview. You will also want to make sure that you are at your best the day of the interview. This means getting adequate sleep and a hearty breakfast are essential to ensure that you are as sharp as possible when time for the interview is at hand. The key to this interview is to demonstrate how well you are able to solve problems and if you are able to work in a group setting. The type of problem or issue presented to you will vary field to field. An engineer would not be asked to solve a business management issue and an investment banker will not be asked the best way to raise a bridge over a ravine. By analyzing your profession and the position you are applying for you should be able to get a broad idea of the type of problem you may be presented with. It is important to remember that the case interview is used to demonstrate your skills and abilities and whether or not you will be the right fit for the company.